For those of you with RC31s and RC29s, how well aligned is your fork? I noticed that on my RC31 the wheel is tilted slightly to the non-drive side. I've confirmed the dishing of the wheel, tried flipping the wheel and checked against a few other wheels. This is something that I only notice when I am looking at it. I've had the fork a little over a year and I didn't notice anything was amiss until I had a 29er wheel in it, which exagerated the problem. Given how long I have had it, is this an issue I dare bug the distributor about? The fork is rideable, but if I could get it replaced I would be happier. I'm not inclined to make a big stink over the issue. Its othewise a fine product. Had my RC31 for about five months, alignment still looks fine. I've had mine for several months. Bought it used. It still looks perfectly aligned. is this an issue I dare bug the distributor about?...if I could get it replaced I would be happier. It's worth an ask. The worst they could say is no and if you have a product that you paid good money for and it has a problem (even if it is just cosmetic) then they should help you be satisfied. Makes sense. 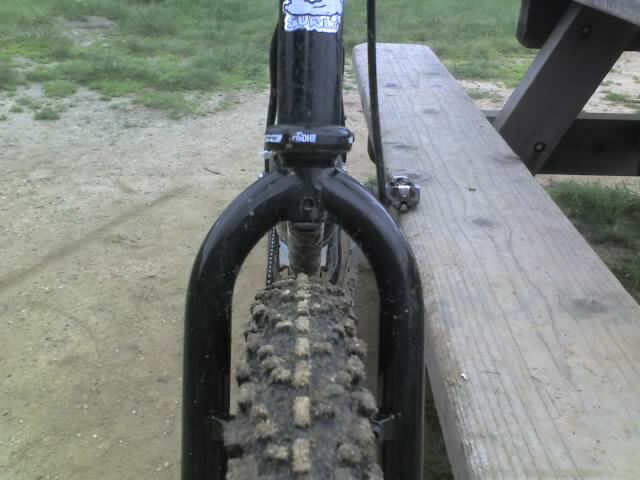 I rode it today and it still rides great, so either way I'll still have a nice fork. I had the same problem with my surly fork . I ended up filing down one drop out with a round file . It did not take much to make it perfect . Just in case you get nowhere with pace and it still bugs you . i would DEFINITELY try. its next to impossible to get one out of alignment unless its damaged. and if it was damaged to the extent that it would cause the wheel to tilt it would be unridable. thus, i would say it came from the factory that way. perhaps it fell within the q/c tolerances for a 26" fork. i'd put a 26" wheel in it and see how noticable it is, but i wouldnt tell them you put a 29er wheel in it since thats outside the intended use and therefore *technically* is not a warrantable issue. if the distributor doesnt give you any love contact pace directly. they stand behind their stuff and i think they'd make it right. all else fails just get a rat tail file and modify the dropout.